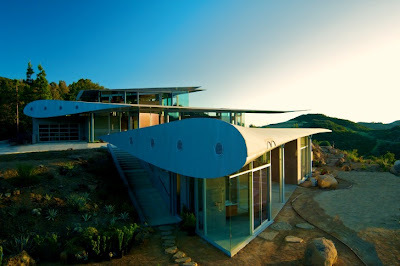 The house uses parts of a decommissioned Boeing 747. Costing less than $50,000 the reclaimed plane has been dismantled and transported to the site, where almost all of the parts have been reused as a way of being economical. Prefabricated parts were also utilized to minimize onsite construction costs. An engine cowling here is used as a fire pit. Besides the extensive use of reclaimed materials, the Wing House also employs solar power, radiant heating, natural ventilation and high performance heat mirror glazing. With views of the Malibu mountains, the Pacific Ocean and the islands in the distance, the 747 Wing House is a sight to behold. Located on a ridge, evening views of the home at sunset recall the same sort of view that one would see while flying in a plane as the sun goes down.